1 - Niamh Kearney: Hola Rafa. I think you're the best and nicest tennis player of all time. Thank you very much for answering our questions. Do you feel more comfortable with the new ball now that the tournament progresses? Thank you very much and good luck. With best wishes, Niamh in Ireland. Rafa: I think so. With progress and training more you get used to them. But one important thing is that the ball is the same for everyone! 2. Enrique Jiménez: Hola Rafa. I've been watching tennis for many years. It is the only sport that the best always wins . My question is about the variety of shots in tennis today. Players with enormous talent as Federer, Djokovic or you, with the ability to do anything with the racquet the forehand and backhand. As the professionals you will have your justification, sure, but why is there not more variety, untidy, short balls to bring to the net, soft balls without force, etc? Good luck in your future undertakings. 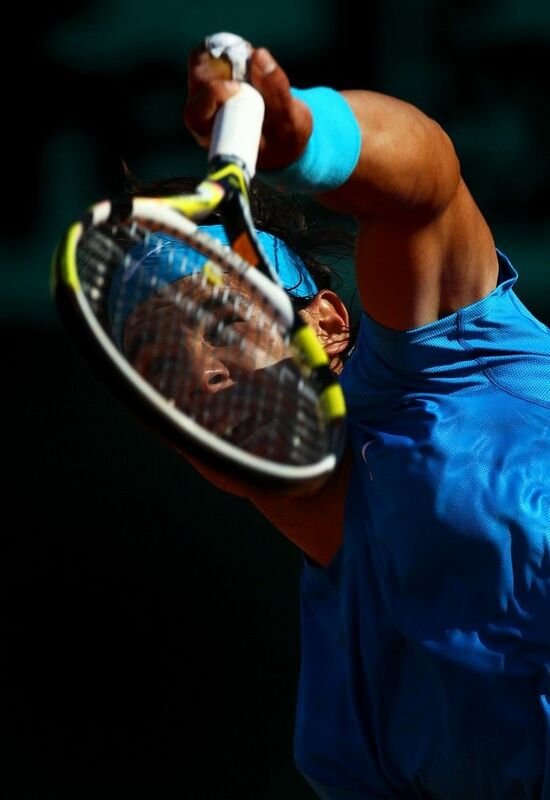 Rafa: The important thing is to win the point and it doesn't matter if it is with a FH, backhand, serve, or finding the BH. What you need to do is win the point. I try that and try to use every shot well to construct the point, to win or to defend that troubles the opponent. I wish it were that simple to say BH now, or do FH to BH and FH..
Rafa: Thank you very much, I need those forces. Sure we joke and talk about everything, that is always in the locker room or restaurant. But we each have our group of friends. In my case are Spanish or Spanish-speaking and Argentine or Colombian who speak more. Is culture and language. 4 - Miguel Gonzalez: Hola Rafa, I've been following you for a long time and all the encouragement in the world for your next match. If you could make a 'bionic' player with the best shots of each player you've seen, who would be his serve, the volley,forehand and backhand would choose? Rafa: Karlovic's serve, Kuerten's backhand, Federer's forehand. 5 - Nacho Recio: Hola Rafa, I wanted to ask you what you usually eat before a game and how long before. Courage, Do not worry, you don't have to prove anything, just enjoy what you do. Rafa: I usually eat pasta and some fish and about two hours earlier. 6 - Mark Barrajón: Hi Rafa, I was in Madrid, but couldn't see you because of Del Potro's injury, shame ... What new values ​​you see in the circuit? There is talk of Young, Dimitrov, but none got off the ground. Good luck and trust yourself as others do. Rafa: Values ​​are those who are young. Others could tell you because I have not seen. 7 - Paul Alfonsea Reyeros: Hola Rafa, I am a great admirer of yours, do not worry because you're not at your best, you are having a great season. Do you suffer much when the Mallorca almost down to the Second (devision)? A greeting and are an example for a lot. See you in the final. Rafa: Uf how I suffered! What happened was fatal! Some incredible nerves! Thankfully, they stayed in the first. 8 - Jesus Guillen Viejo: Good morning Rafa. It is fortunate to have in Spain an athlete like you. I was curious: Do the tennis circuit pay for your travel, accommodation,food etc. .. and what of your equipment, or every tournament subsidizes some or all? Thank you very much. Rafa: Yes, for travels we pay ourselves. The hotels are paid by the tournaments and we don't have to subsidize. In my case, I have good sponsors who always helped me. Now it's something else, obviously! 9 - M ª Teresa: Although I know that is still far are you going to go to the Davis Cup in July? Rafa: I always like to play the Davis Cup and represent Spain. When I can't go has been hard. 10 - Isabel Romay: Hola Rafa, I want you to know that these years you have been in my model to withstand the pressure timea of examination and the challenges of the studies. I'd like you to recommend some books that you like. Kisses from the Canary Islands. Your big fan. Here we too have beautiful beaches. Rafa: The boy in the striped pajamas.